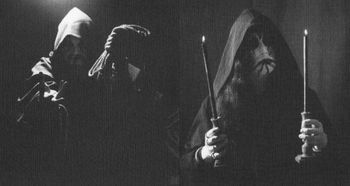 Lucifugum was formed in 1995 in Zhytomyr, Ukraine by apostate Khlyst and guitarist/bassist Bal-a-Myth and singer Faunus. The latter left Lucifugum in 2001, while the former died in his sleep in 2002 after abusing drugs. Khlyst utilized many session musicians until uniting with Stabaath (later in unholy matrimony) and moving to Mykolayiv. Ellena’s first album was 2003’s Vector 33, which referred to the supposed age of Jesus upon death. Khlyst owns Propaganda. The band shared members and ideology with Nokturnal Mortum for a while, but have since had a difference of opinion and drifted apart. The rating for the newest Lucifugum album was bumped up because of the band’s strong convictions. Information like “Not for degenerative black 'n' roll fans,” or “no internet wallpaper” or “members don’t have any side-projects” are examples of the Ukrainian group’s superior way of thinking. No need to run to MySpace to find the band’s page. There never will be one.